LONDON -- A BBC editorial watchdog body criticised the British broadcaster Thursday for breaching its own guidelines by appearing to promote the bands U2 and Coldplay in its coverage of them. 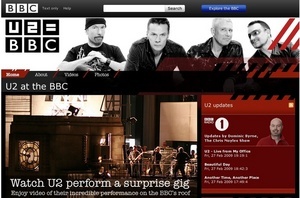 The BBC's Editorial Complaints Unit slammed an on-screen slogan "U2=BBC" used during its coverage of U2's last album as "inappropriate," while a "Radio 1 presents Coldplay" website broke guidelines about links to external sites. The findings came after RadioCentre, the trade body for commercial radio firms in Britain, complained about the BBC's coverage of a Coldplay tour and U2's launch of its "No Line On The Horizon." The U2 coverage last February included a performance by the band on the rooftop of the BBC's Broadcasting House head office in central London which briefly brought traffic to a standstill. - a "Radio 1 presents Coldplay" website included links to the websites of ticket agents. "This was not in keeping with the BBC's guidelines on links to external websites." - the use of the mathematical symbol for identity in the graphic "U2=BBC" "gave an inappropriate impression of endorsement." - a pre-recorded interview with U2 frontman Bono was mostly alright, but a reference to Radio 1 being "part of launching this new album" was not. Complaints about a radio show and a BBC news report about the rooftop concert were not upheld, said the watchdog. This page contains a single entry by Jonathan published on January 15, 2010 3:57 AM. BBC admits it went too far in U2 tie-up was the previous entry in this blog. Bono and Alicia Keys join Hope For Haiti benefit is the next entry in this blog.